Wicker furniture is a century old art form practiced by skilled wicker craftsmen around the world. Wicker furniture is equally at home in an elegant city apartment, suburban sunroom or a vacation retreat. Today, with the addition of modern materials, your favorite wicker furniture styles can be enjoyed as Outdoor Furniture without concern to the outdoor weather. Wicker is a finished product that is made from natural materials such as rattan, rush, banana bark, willow and others. The term wicker refers to the process of the weave. 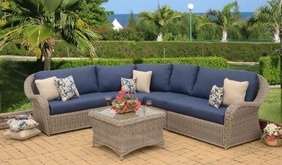 A wide assortment of styles (Contemporary, Victorian and others) make wicker an ideal choice for furnishing your home or outdoor. It is also lightweight and water resistance making it popular for outdoor furniture. Designs in our collection of wicker furniture and rattan furniture will suit any style and each piece will find a way to blend with existing decor or become a welcome enhancement to a new space and that's beauty of wicker furniture or rattan furniture in our selections. Rattan is a vine that grows in the tropical rainforests of Southeast Asia. Unlike bamboo, rattan is a solid core material. Rattan vines grow hundreds of feet in length and is one of nature's strongest materials. Rattan will not splinter or break, which makes it ideal for making furniture. All Weather Wicker is indoor/outdoor wicker furniture made entirely of man made materials. Sturdy frames are rustproof and handcrafted from either aluminium or steel with soft woven vinyl or resin fibers that resembles the finest handwoven wicker. Modern elegance combined with old world splendor give Wicker Furniture and rattan furniture a place in any decor. Aside from wicker, we also offer a large selection of Cast Aluminum Furniture and Teakwood furniture , both of which make an excellent addition to any patio or backyard. Plus, we also offer custom-made replacement cushions with your choice of fabric, and outdoor umbrellas . *Free shipping only applies to orders over $995 after discount. For certain states, a fuel surcharge is still charged when items are shipped via motor freight. 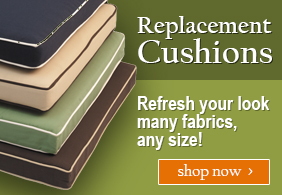 Cushion replacement orders not included in free shipping promotion. Please check out our Shipping Info page for more information. Due to demand during our busy season, Sets make take 3-5 weeks to ship. Current sale offer valid for new online orders only. Discount cannot be applied to previous orders.